Donald Trump is considering Cap'n Crunch as his running mate after weeks of Crunch providing him with superior foreign policy advice. 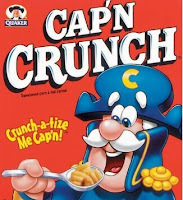 WASHINGTON (The Nil Admirari) - Today, Republican presidential frontrunner and small-handed billionaire Donald Trump confirmed reports his campaign was vetting Cap'n Crunch to be his running mate. Trump declared Crunch was his primary foreign policy adviser, and had earned his respect over the last few weeks. "Cap'n Crunch is an amazing military leader, and just a hugely great guy. I believe he served in Afghanistan, and maybe Shangri-La, or something like that," explained Trump. Trump continued, "Crunch has been giving me hugely valuable advice on who I should be killing in the first months of my presidency. I'm not gonna lie, it's a big list." "I also have to say the slander that his policies cut open the roof of your mouth is going to start a lot of lawsuits when I become president," promised Trump. An unidentified member of the press asked Trump if the rumors the roof of his mouth had been cut open recently were true.